Grab your Capuchino, We’re leaving! There are a few Fiats I’d like all Fiat executives to spend a compulsory weekend driving. And the 127 would be one of them. Throw away you’re executive saloons, Lancias, Ferraris, and Alfas, and come and understand what driving is about, and what driving a Fiat should always feel like. The route to commercial salvation for Fiat lies in its roots. Its roots lie in the 127 passion play. My reminder came in Italy. Palanza sticks out into the heart Lake Maggiore in the Alps, and it was here I booked a late summer holiday with my other half. Two weeks relaxation, with great air, scenic mountains, Italian cuisine and the local ferry boat. Only I don’t do sunbathing and the organisers hadn’t any sailing, rowing or other sport options on offer. So my thoughts turn to driving as naturally as my wife’s did to shopping. Then the day came when the car hire company ran short of my daily diet of Citroen, and after some arm twisting (aka extra dosh) offered me his cousin’s Fiat 127 Special (third series) with Rome plates. After 3 days I nearly bought it and drove home. The canvas sunroof was already stowed in the back. What we couldn’t do to the mountain hairpins and rapid descents wasn’t worth talking about. I batted down one village high street. The only souls around (siesta time) were two black swathed ladies approaching a crossing. Who then flatly refused to budge from the sidewalk at the crossing where I'd stopped until I was gone. Deep suspicion filled their eyes. Then there was the new 911 with the opening and closing rear engine spoiler I just had to keep up with on the long descent into Switzerland on the Simplon Pass (at well over 110mph). The little car never missed a beat. And my wife slept through most of it, except when woken to take in Scenery, Pasta or Shops. Thank You Truly Fiat for making a good holiday great. In 1971 Fiat announced the eventual replacement to the 850 series. Its design, like the 1969 128, was based on the early sixties prototypes and the 1964 Autobianchi front wheel drive. It had a 903cc transverse engine. The 127 also retained the basic mechanical layout of the 128, using its suspension brakes and steering, while the engine came from the 850 sport range. The look of the 127 quickly gave it many ‘Car of the Year’ accolades. It was a two door, with its ‘Fastback’ steeply slanting rear window – soon to become a 3 door hatch, (from 1972) with a folding rear bench seat. The suspension design was an immediate success, with front struts coil springs and anti-roll bar. While the rear suspension had a transverse leaf spring and lower wishbone layout that Fiat would retain in small saloons for the next decade. From 1974 a 127 Special was produced with higher level body finish (Bumpers grill and side moldings) and interior dash. Unfortunately from 1976, anti-pollution treatment lowered the power output of the engine to 45bhp and 135kph top speed. From 1976 Seat also produced a four door version of the 127 in Spain. In 1977 a new range of 127s was introduced. These included the new Brazilian built 1050cc engines in the 127 CL as an option to the 903cc type. With demand still as strong as ever, in the Summer of 1978 Fiat launched the 127 Sport. The car interior now takes on a modern contemporary look, with a unique steering wheel, cloth seats and integral headrests a double rear seat replacing the bench, and an integral front bumper/spoiler. Increased compression ratio, larger valves better brakes tyres and stiffer suspension and a twin choke carb. made this a very sporty package. Top speed was now 100mph. Production continued into 1981. 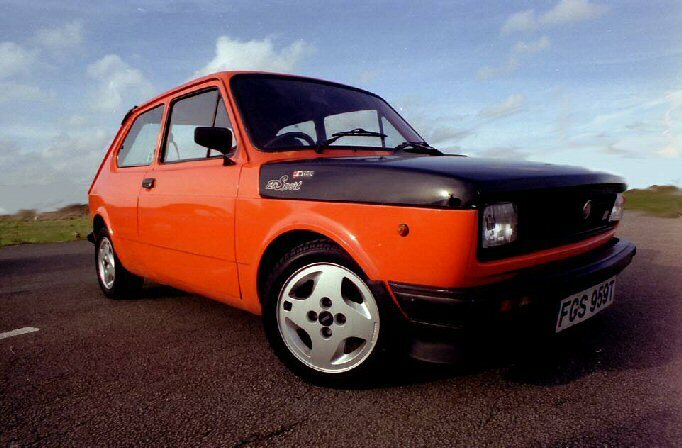 While continuing the production of the 127 ‘Series Special’, in June 1979 Fiat launched the 127 Top. It was a 3 door saloon with the 1050cc 50bhp engine. Only produced in metallic bronze or metallic blue colours, the blue one also had a canvas sunroof and factory tinted windows. Wider 155 section tyres were also fitted as standard. Production lasted until 1981. In November the 127 Rustica was announced. It was a development of the Brazilian made ‘147’. With a stronger (45kilos heavier) body, brakes and lower final drive ratios. These were all designed for use on rough terrain. Fuel tank capacity was increased and the interior simplified. Front and rear was protected by ‘nudge bars’ and a large roof rack was available. All Rusticas were beige coloured. April 1980 saw the production of a five door version, the 127 C. It was an upgraded version of the 1977 ‘Comfort’ with better interior trim and instrumentation. It was replaced by the 127 Super in 1981. In November the estate version of the 127 was launched, again derived from the Brazilian ‘147’ series and replaced the 128 Panorama. It had a payload of 450kg. While 1981 saw the introduction of another Brazilian based design, the 127 diesel. In Spring 1981 the whole 127 range was revitalised as the Special, Super or Sport. The original Super and Special versions were replaced with the L and CL. The 127's lines where de cluttered of chrome trim, cleaned up and generally improved. More attention was paid to the finish and style of the interiors too. Engines were supplied with either 900cc or 1050cc. The new ‘Super’ was an upgraded 127 'Top'. Only the 5 door version of the previous CL type was retained. The larger engined version of the 127 Sport now also produced 70 bhp. 1981 saw the introduction of the third series of 127. The be-spoilered 127 Sport was also available with a 1301cc sohc engine. Production of this model continued until 1983. From this year the diesel, estate and saloon versions, originally introduced in 1981 and upgraded in 1982, were presented with larger clutches and more robust engine/ exhaust mounts. They also delivered significantly lower fuel consumption with their extra power. The 127 was superceded by the Uno as this gained in popularity.